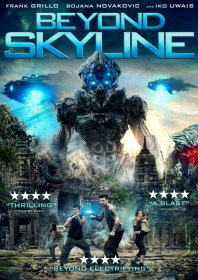 Utterly bonkers sequel to 2010’s Skyline, an alien invasion movie from visual effects masters The Brothers Strause. The siblings take producer credits for the follow-up, and the first film’s writer, Liam O’Donnell, steps in to write and direct the sequel. It is relentless and nutty and always entertaining. We are introduced to drunk single dad Mark (Frank Grillo) and his wayward son Trent, who are both a lost cause in need of a quest, when a spaceship arrives and obliterates Los Angeles, unleashing giant aliens firing blue light, abducting people and sucking out their brains. Mark and his makeshift group of resistance fighters are captured and orchestrate a rebellion from within the spaceship, causing it to crash land in Indonesia, where we meet up with a brother and sister guerrilla team (Iko Uwais and Pamelyn Chee) who trade guns for knives and go toe-to-toe with the aliens in martial arts battles. And all of this happens within the first act. There’s a brilliant bit when one of the aliens does a roundhouse kick, and it’s at this stage of the film when you realise that Liam O’Donnell might not be taking any of this very seriously at all. And, thank god for that, because the film is all the better for it. Grillo does well to remain stoic in the face of such overwhelming nonsense, particularly considering a good 50 per cent of the film has been added in post-production; and The Raid stars Iko Uwais and Yayan Ruhian – in their first English-language roles – use their silat knife-fighting skills brilliantly against hoards of imaginary monsters. The film culminates in the sort of landmark-based giant alien pugilism that Ray Harryhausen would have been proud of. As soon as it ends, you won’t remember a single character name or their motives, but you will admire the film for being so unashamedly insane. Bravo. AKA: Beyond the Skyline; Skyline 2. 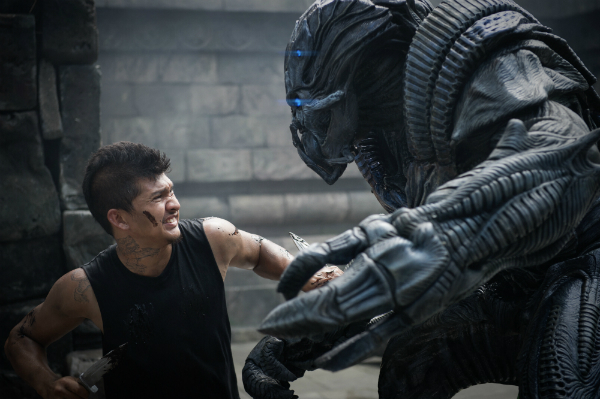 Beyond Skyline is available on digital HD from 15 December and DVD and Blu-ray from 8 January 2018 from Signature Entertainment. Buy it here from Amazon.